Welcome to 2016 may you achieve all the outcomes you desire in this new year! Many folks have set their intentions on changes they wish in the new year and I am no exception. Twelve hours in and so far so good:) Enjoy this first day of 2016! Flintstones vitamins came out when I was a kiddo and I recall taking one now and again but not on a regular basis. I heard no talk of vitamins really other than oranges and orange juice provided vitamin C. Although I had no idea what Vitamin C was good for I assumed it was something we needed. Today properly prescribed and taken prescription medications kill well over 80.000 people each year or 219 people per day. Think those numbers are high? Merck killed off over 55,000 with some thinking that number could easily be closer to half a million people with VIOXX before they decided to pull it from the marketplace. Vitamins on the other hand have never been attributed to deaths, ever. And yet the media, bought and paid for by its largest advertiser, big pharma, will allow garbage pieces like “vitamins cause cancer” etc. to be used without substantiation. From curing cancer, MS, arthritis, to resolving Mental health issues including depression and schizophrenia in a matter of days, Mega dose vitamin therapy has been around, studied, and utilized for ages. In 1750 it was discovered that limes/citrus would thwart scurvy but the medical establishment refused to acknowledge that fact for 50 more years allowing 100,000 plus more British sailors to perish before implementing it in their diet at sea. I would like to share with you a movie all about vitamins and their role in our wellness and as a healing mechanism. Dr. Andrew Saul is considered the leader in orthomolecular medicine or taking of supplements to improve health and he is the leader in this film. He has a brand new movie out and it is FREE for the next two weeks. Do yourself a favor and watch this movie and learn the truths about vitamins roles in our wellness and healing. All you need do is share a first name and email address. 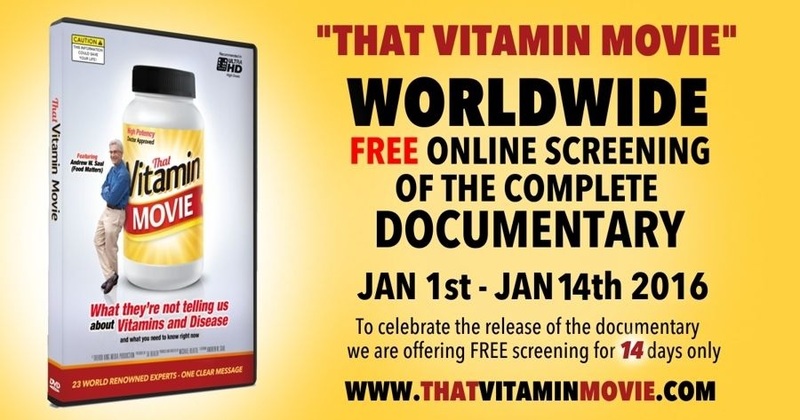 https://thatvitaminmovie.com/ Watch and Be Well-Happy New Year!